A couple evenings ago I went out to close up the coop. I remembered that one of the hens had not provided her daily contribution to the cause. As I closed everything up I checked the nesting boxes and found a shelless egg. Now, I have heard of such a thing. 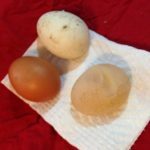 In my research of raising hens and ducks I saw the occasional mention of eggs that have no shell. This is the first time I’ve actually seen one. 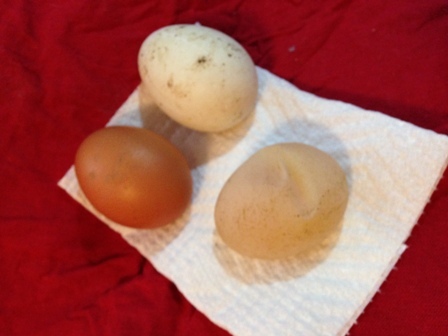 In the picture below, you see one standard brown chicken egg, one rather gunky duck egg, then the shelless egg. It feels a little like a balloon filled with gelatin. Why do they lay eggs like this? It is difficult to tell. Factors such as nutrition, stress, or simply a biological hiccup. It could also be due to the shortening of daylight as we move from late summer through early fall. I feed them a quality product, provide additional calcium with oyster and egg shell available every day. They have plenty of water available and get some “free play” time several days per week. Since they are otherwise happy and healthy I will just chalk it up to her youth and a biological hiccup. A shelless egg in comparison to regular eggs.